BGIS is a leading provider of real estate management services, including facilities management, project delivery services, energy and sustainability solutions, building performance management, workplace advisory and management, and real estate services. A company that prides itself being green, when it came time to redesign its 6,000 square foot office building in Ottawa, BGIS opted to go with a Philips Lighting integrated controls solution. Traditionally, control systems require a complicated design, expensive commissioning, and additional material costs on top of an already expensive building project. With Philips SpaceWise, the solution involves embedded sensors and wireless controls, without extra wiring between luminaires or to the compatible wireless switches. Philips systems engineers calculate the optimum value features for standard office applications and pre-program them in SpaceWise. This allows for a pre-packaged out-of-the-box application solution, while also giving the flexibility to tune the room light levels in the field. 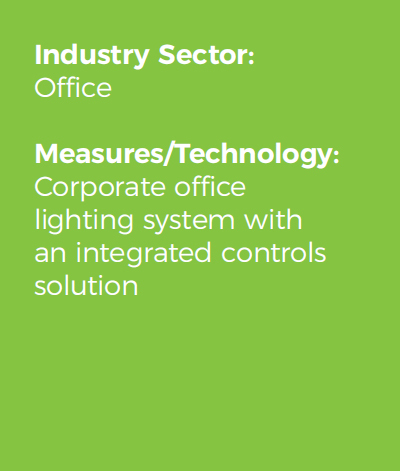 SpaceWise Technology is designed for achieving sustainable objectives and provides controls behaviors for the entire office suite. 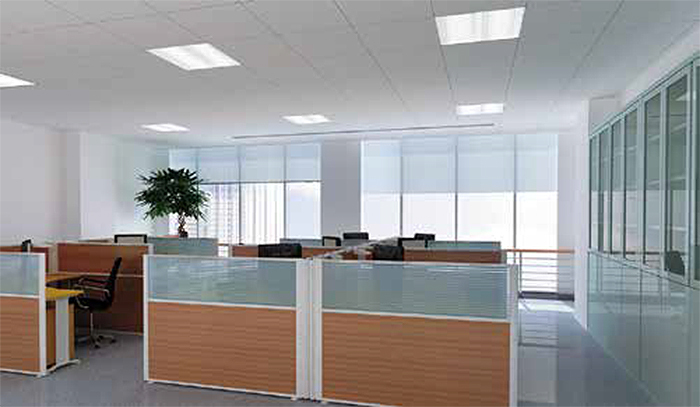 Traditionally, energy savings have come at the cost of light levels or increased glare. SpaceWise Technology delivers aggressive, ongoing savings by augmenting wattage reduction with smart granular dimming and no visual compromise. In open plan areas, the system protects the aesthetic of the space by maintaining a background light level and will not turn off individual luminaires until the entire wireless zone is unoccupied. The dimming behaviors are gentle and unobtrusive. 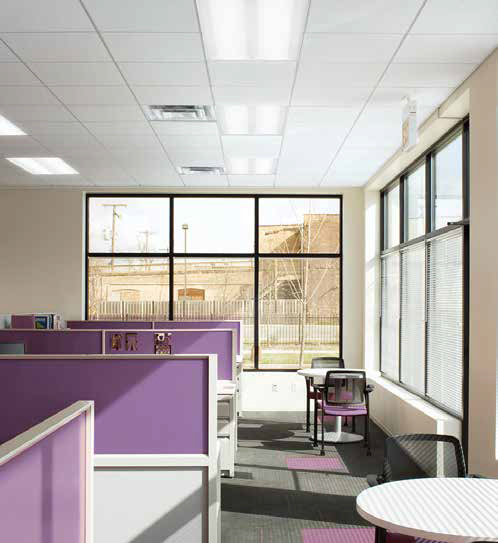 Full light output is delivered only to workstations that are actually occupied so energy is not wasted on full output for transition presence. Remarkably, the background setting typically dims down to 1/3 of the output, but the visual appearance is so subtle that the difference is almost indiscernible. 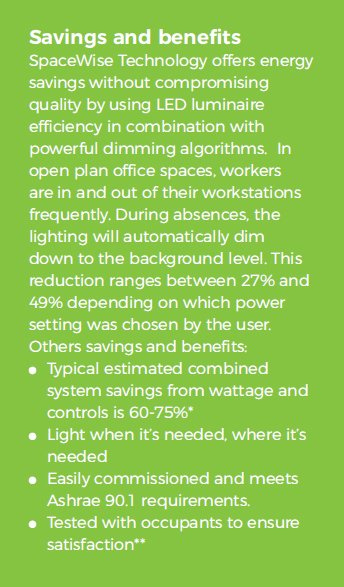 In private offices, the wireless switch supports individual dimming preferences. In meeting rooms, different scenes are available to accommodate presentations, pre-set dim levels, or daylight sensing. "At BGIS, we are continuously reviewing new technology that will allow us to minimize our carbon footprint. We were able to realize energy savings, as well as significant light level improvements, with the Philips LED lighting solution." *Against a comparison baseline of 3-lamp T8 2’x4’ troffers on 8x10 centers without dimming controls. **Based on before and after occupant surveys using a third party independent lighting satisfaction survey tool. The BEIC is an industry-driven initiative to accelerate the collaboration, innovation, and adoption of clean building technologies across Canada.